The historical biopic of awesome wrestler "Mahavir Singh Phogat" , is getting good positive response. He was from Haryana and it movie named "Dangal". Aamir khan is doing main lead role in this movie and it was released on 23rd December, Friday in many screens across the Globe. It has released in more than 3800 screens across the Globe, which is a huge release for Aamir’s Dangal movie. 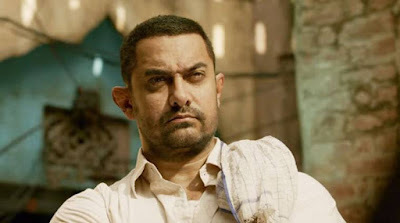 Lets read more about Dangal 3rd Day Collection. Aamir Khan Dangal movie has finally managed to collect an awesome box office business at domestic and worldwide circuit. It got a massive response from audiences as well as from critics. It managed to registered one record by collected second highest opening day collection business. The movie has collected total 29.78 crore business on the first day of its release. #Dangal wrestles demonetisation... Sets the BO on fire... Ends the lull phase... Fri ₹ 29.78 cr [incl ₹ 59 lacs from Tamil and Telugu]. Lets read about dangal 3rd day collection: The movie started big in the morning shows as the occupancy was in the range of 70%. But in north side its morning show occupancy is low due to rain and Christmas 2016. But due to good reviews and public word of mouth it higher up to 85% in the afternoon. evening shows was houseful in many multiplexes. North India/Delhi/UP, East Punjab and Haryana people giving super awesome reviews to the movie and its expected the movie would earn very nice income in upcoming days. As per reports, ‘Dangal’ released in 5,300 screens - 4,300 in the domestic market and 1,000 overseas. On first day the movie has collected total RS. 29.78 crore. Second day it fetched total 30 Crore, making it 2 days total around 60 crore. Sunday is 3rd day of this movie and as per advance tickets booking and people reaction, the movie would earn total 35 crore. Dangal 1st weekend total collection would be more than 90 crore. The movie is also getting good response and doing well in the overseas box office. It has collected Rs 5.49 crore, Rs 4.62 crores and Rs 1.22 crores in North America, Middle East and Australia respectively. #Dangal - OVERSEAS - Till Friday: $ 4.2 million [₹ 28.49 cr]... Several screens yet to report... Best in UAE-GCC and N America. Though movie has earned nice box office business on first day but it failed to beat opening day collections record of Salman's Sultan. Aamir's ‘Dangal’, earned total Rs 29.78 crore in India on its opening day, while Salman Khan "Sultan", had grossed Rs 36.54 crore on the opening day.